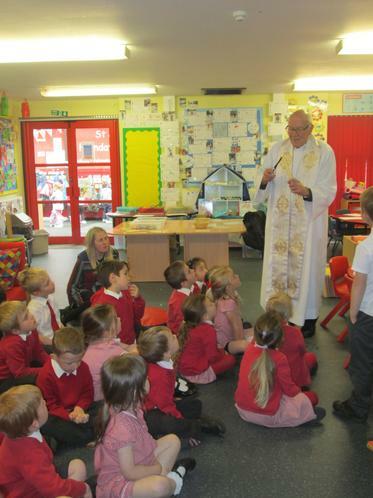 Bishop Mark visited the school and met all the pupils, staff and parishioners from St James RC Church. 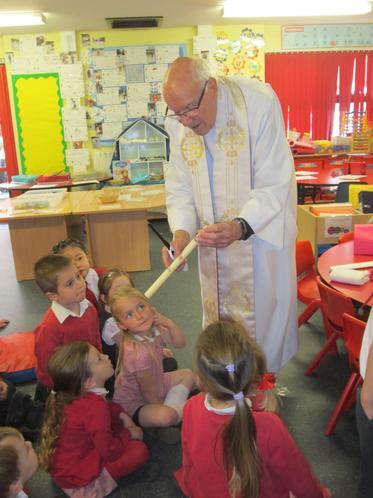 The pupils led a welcoming liturgy and, in class, had many questions to ask Bishop Mark about his role on the Church and our school. 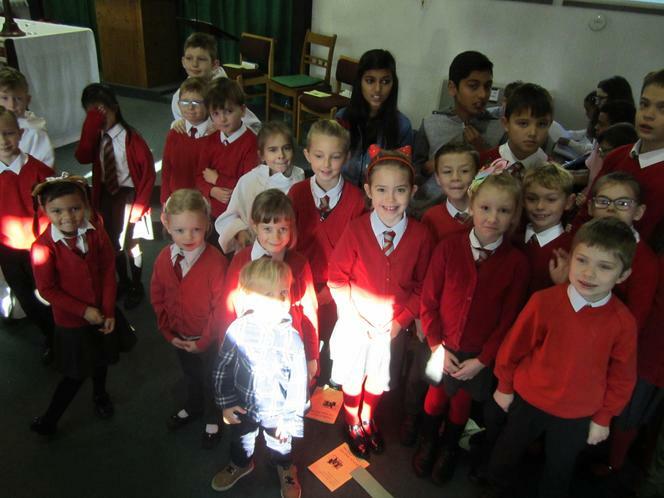 Children from St John's joined the parishioners at St James' Church to lead Mass on the World Day for the Poor. 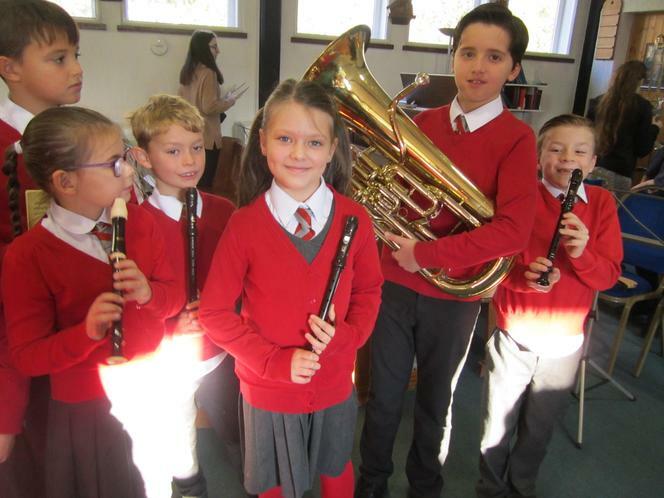 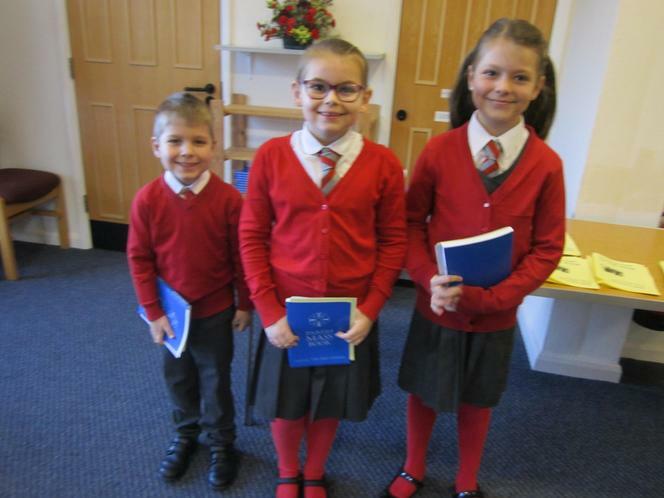 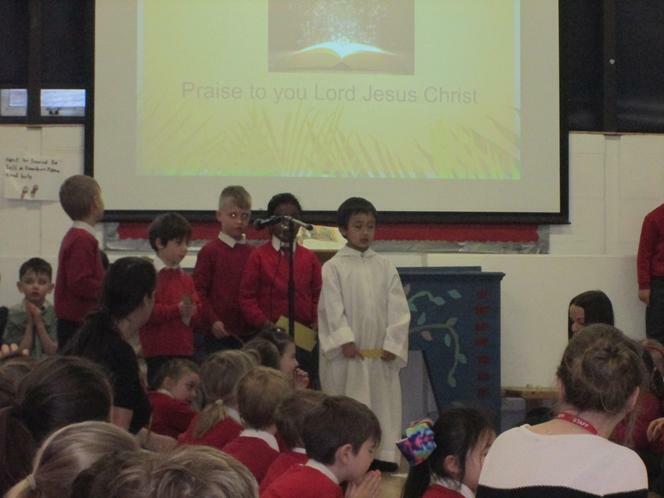 The children welcomed parishioners, served on the altar, read the readings and prayers, played music and sang together. 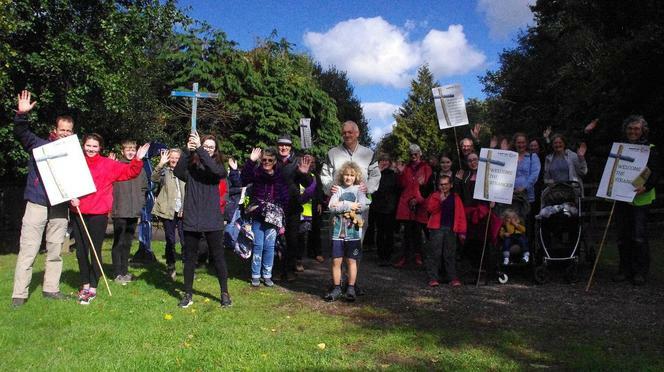 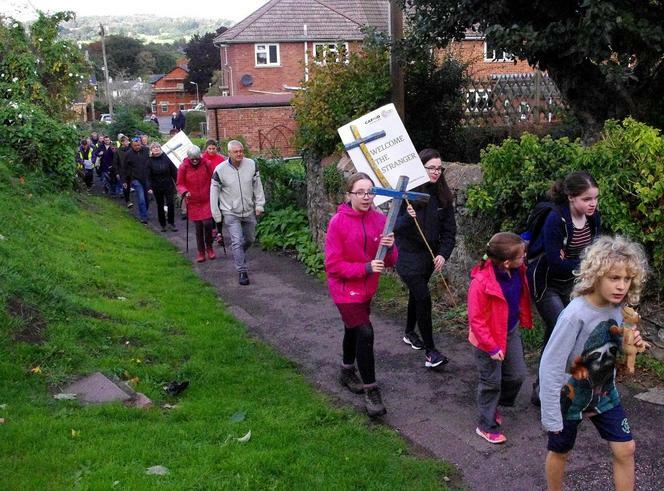 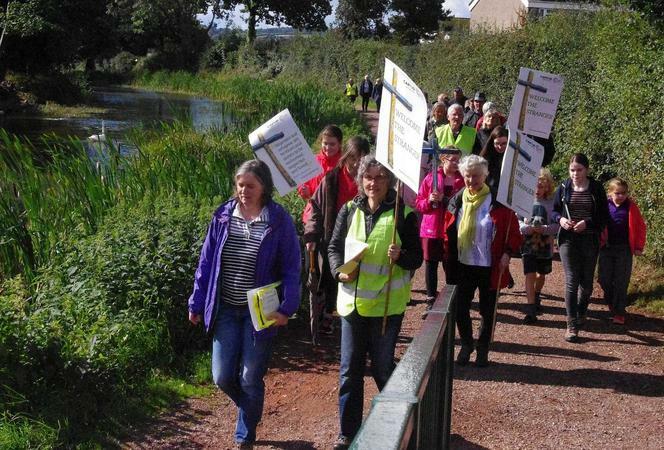 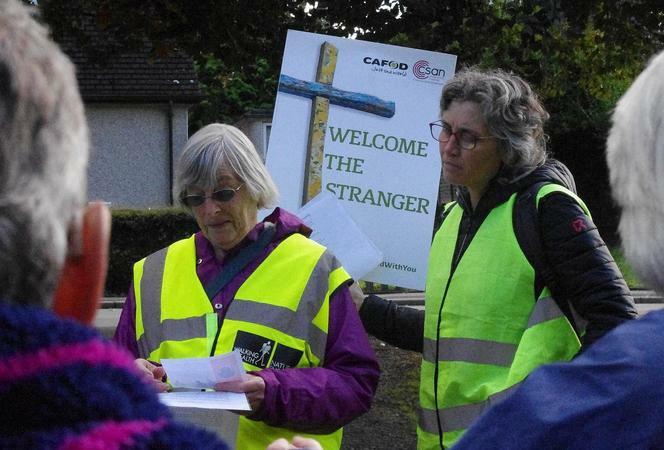 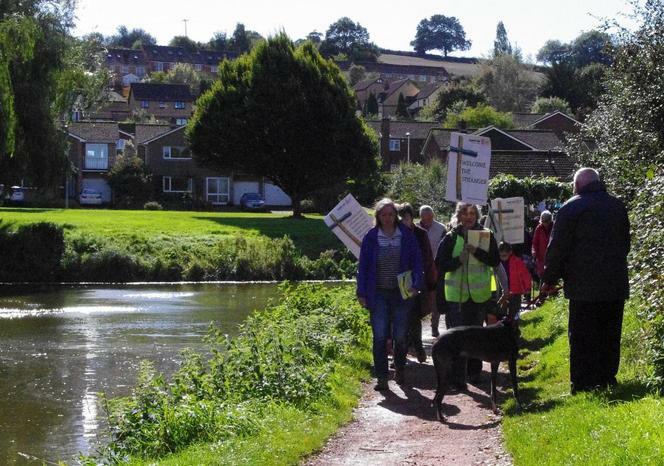 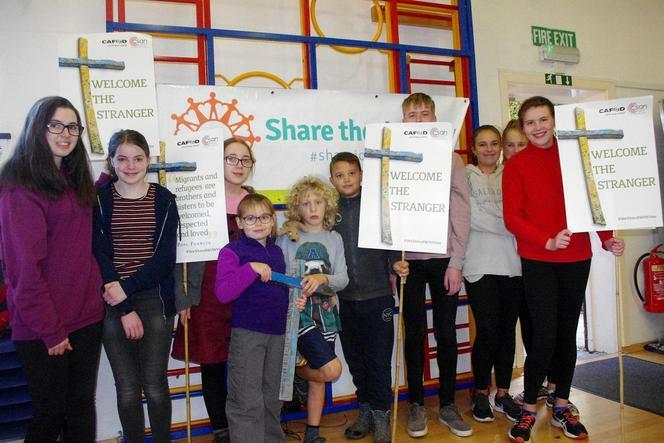 Staff and pupils from St John's, along with parishioners from St James' and St Boniface, joined together and walked 4 miles from the parish church to school on Sunday September 23rd to raise awareness about the plight of refugees and to support Pope Francis' call to encounter and walk with these migrants and refugees in support and solidarity. 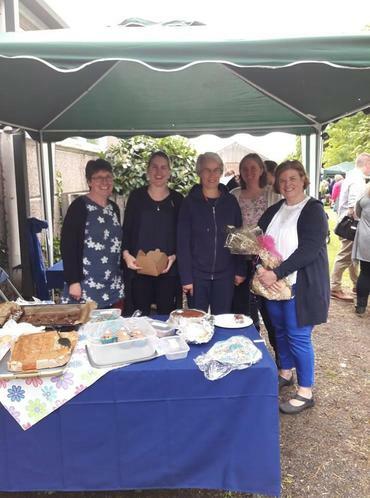 St John's joined parishioners from St James and St Boniface to enjoy the summer fete at St James'. 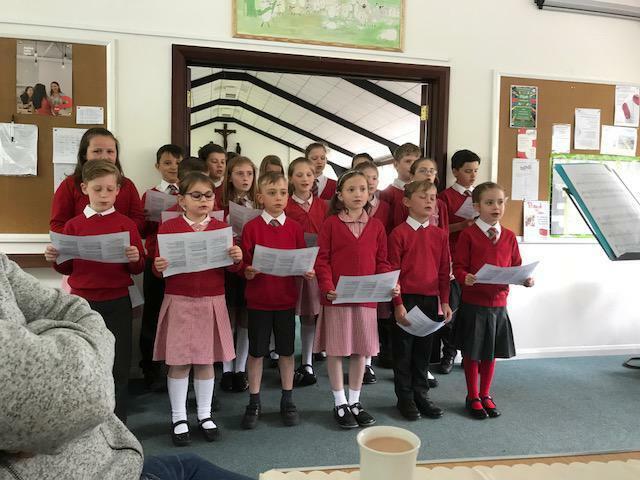 Starmakers sang beautifully to entertain tea drinkers and members of staff ran the cake stall. 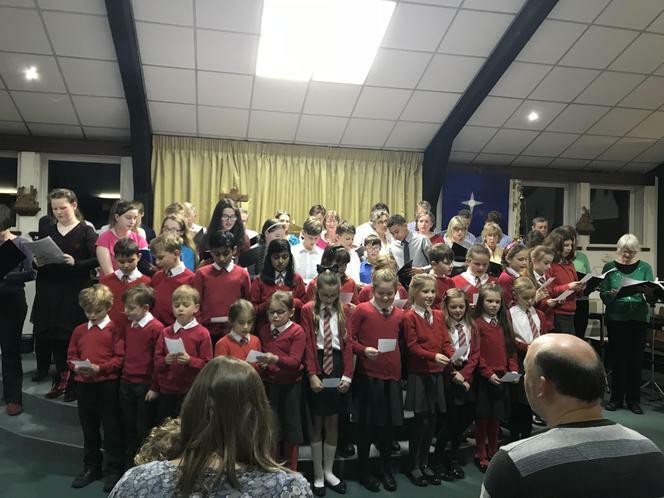 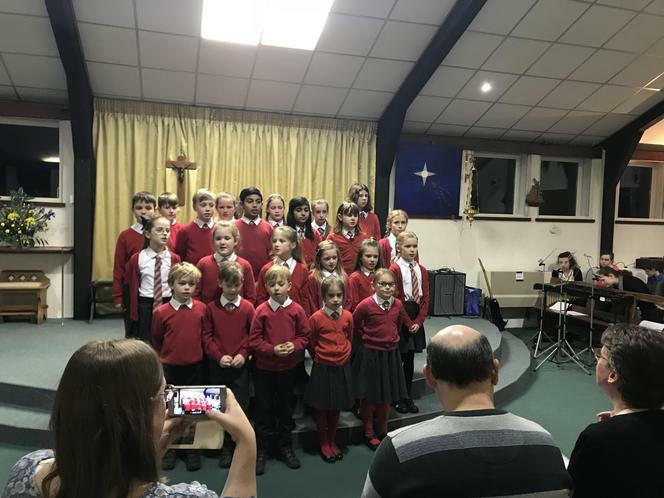 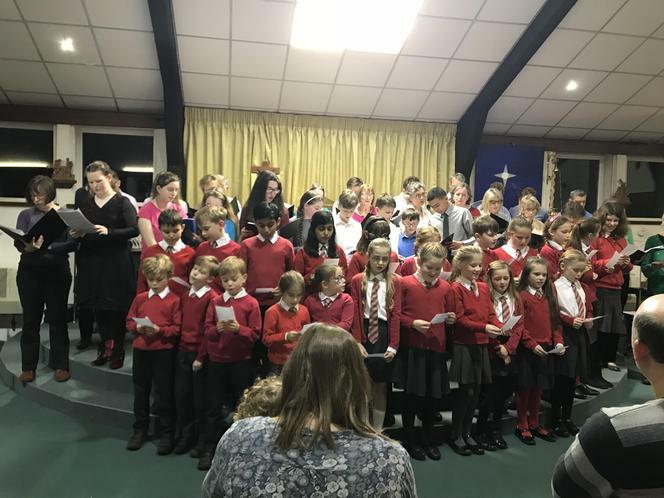 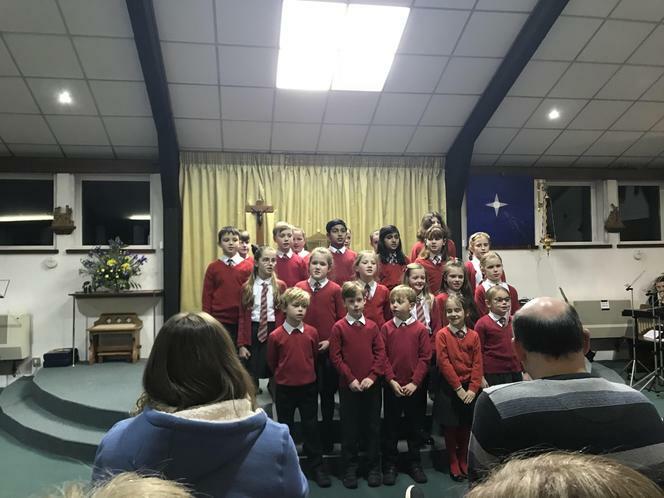 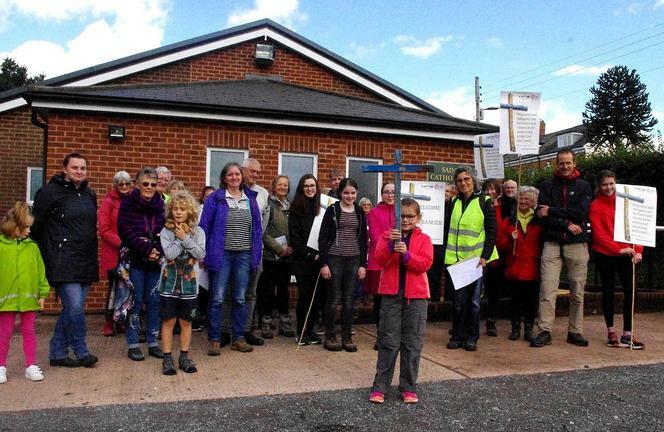 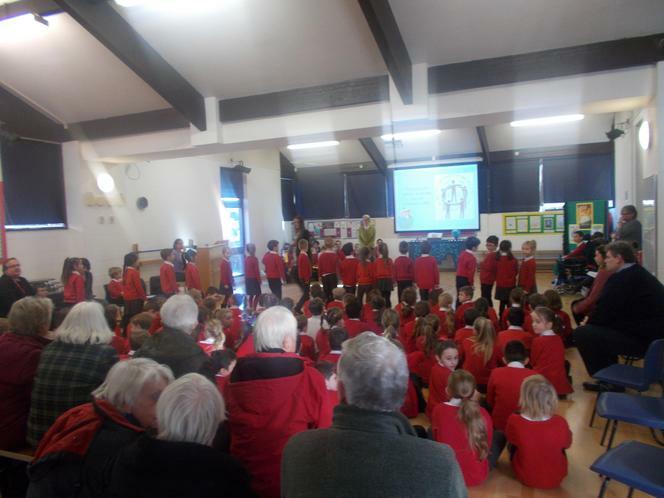 The event was a huge success raising £2200 for the New Church Building Fund. 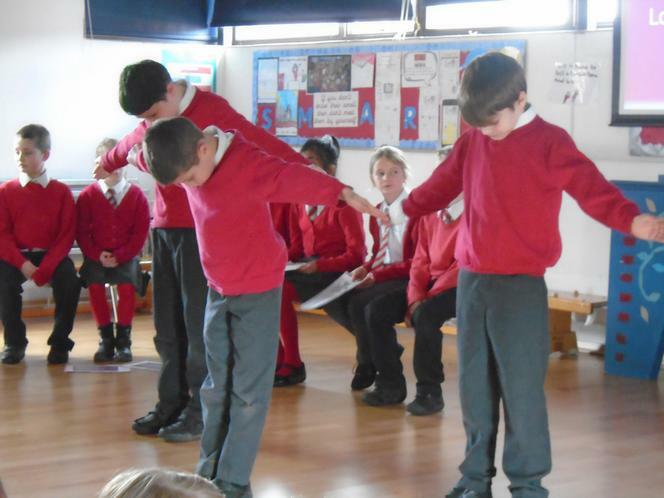 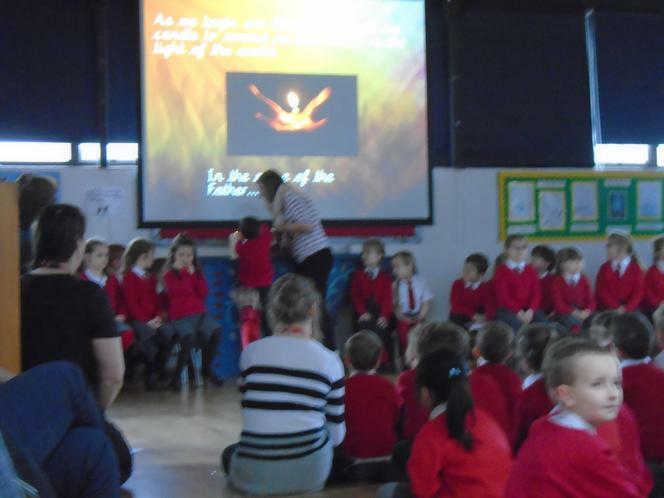 On the last day of term we followed the journey of Holy Week. 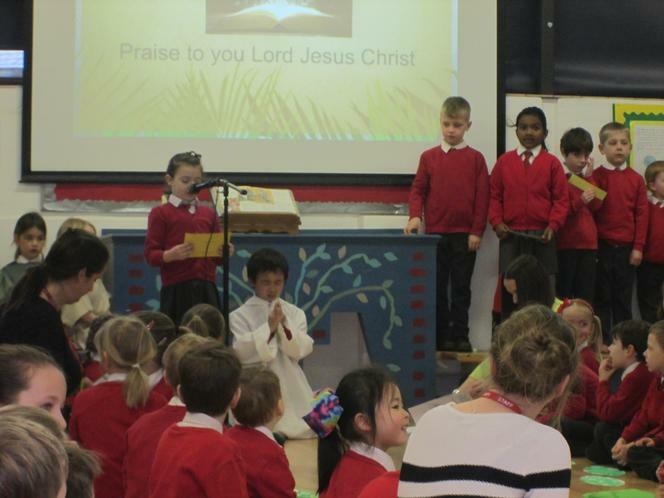 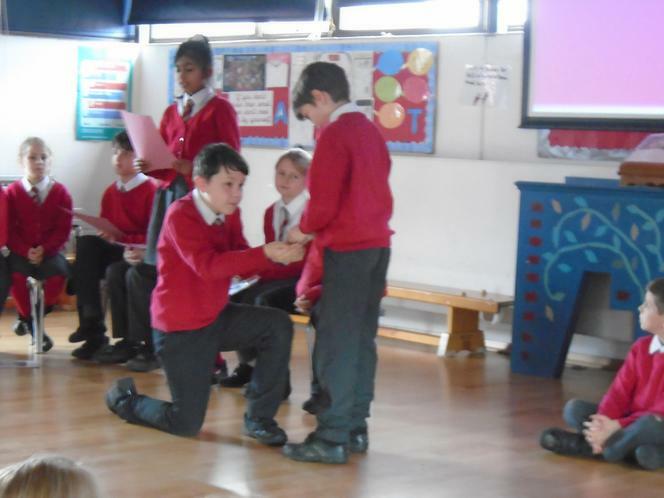 Each class led a liturgy, taking us through the events from Palm Sunday to Good Friday. 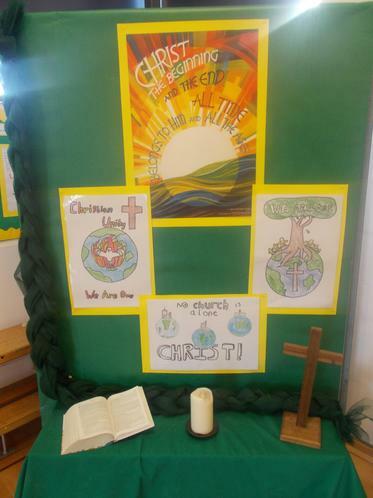 After the holidays, Year 4 will complete our liturgies with Easter Sunday. 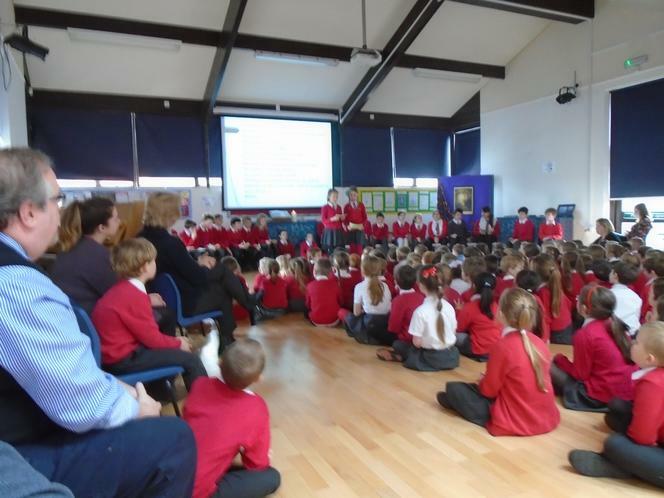 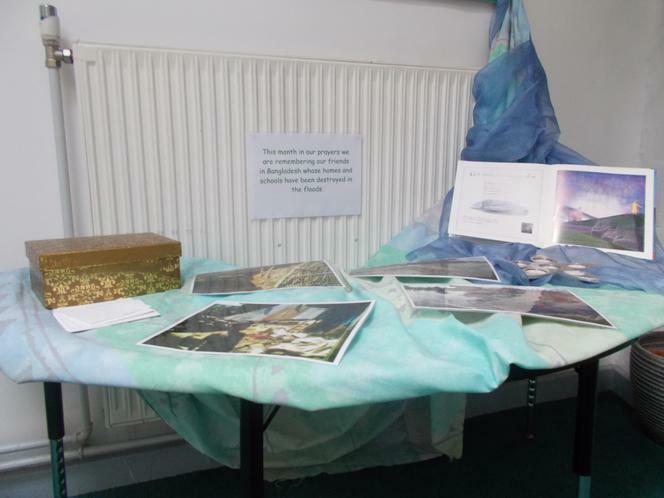 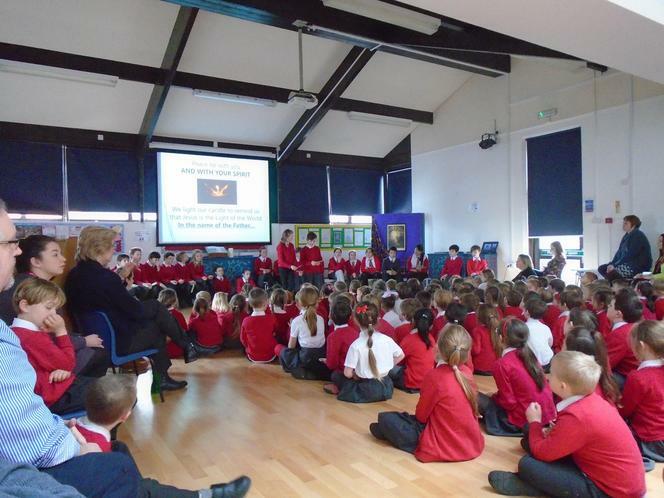 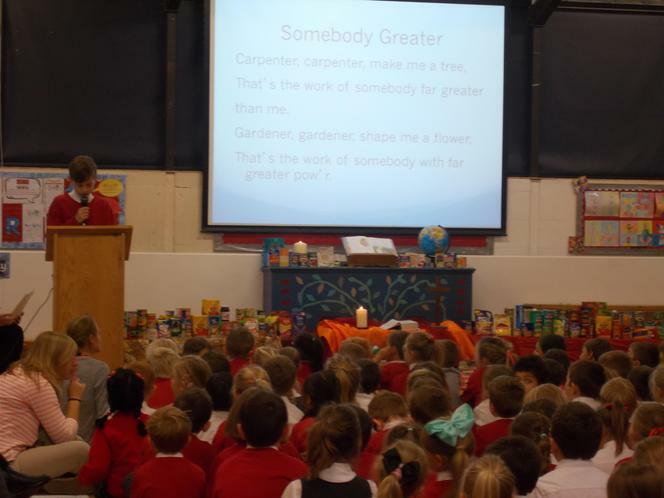 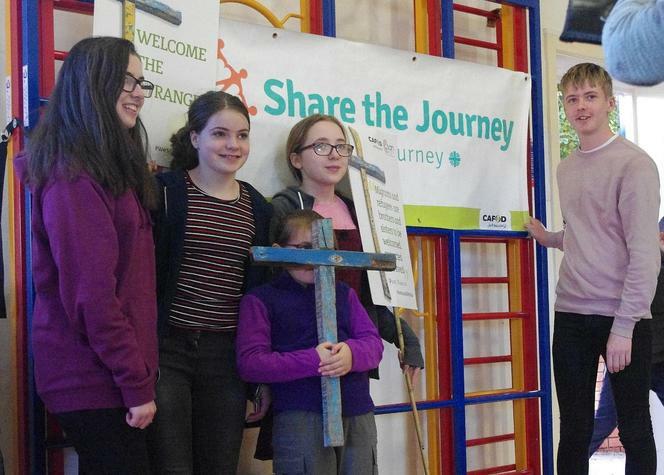 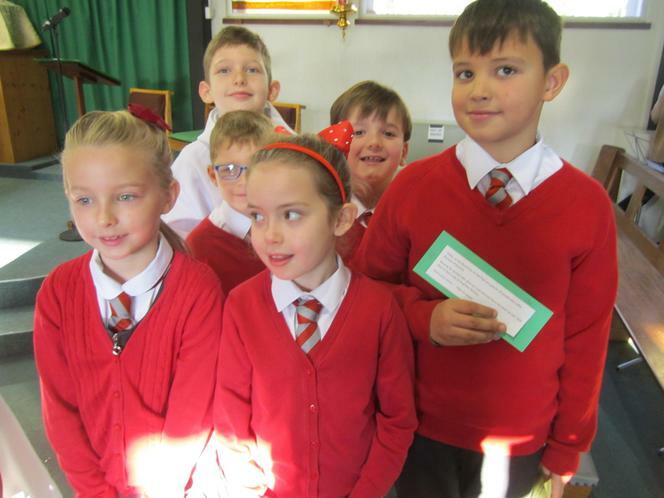 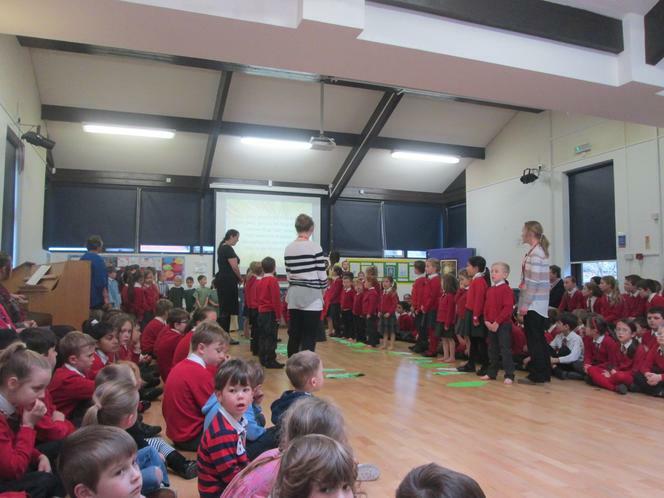 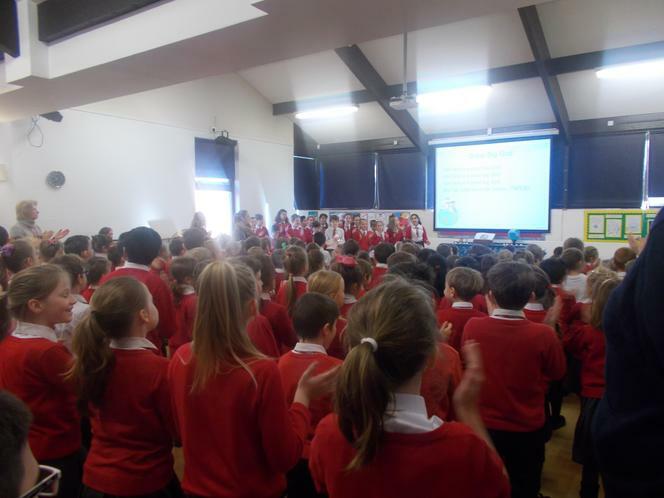 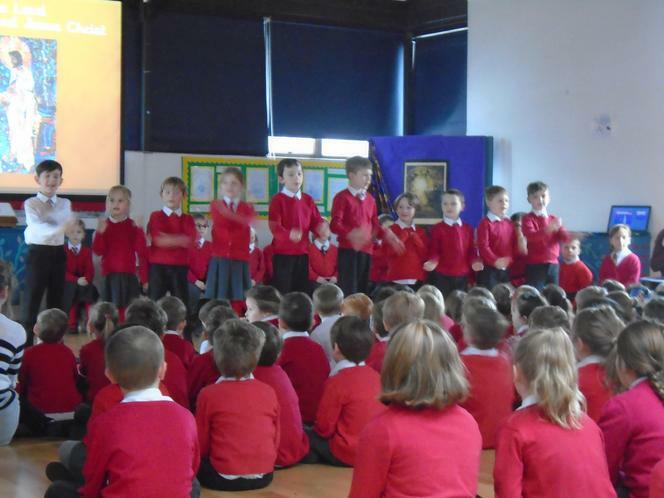 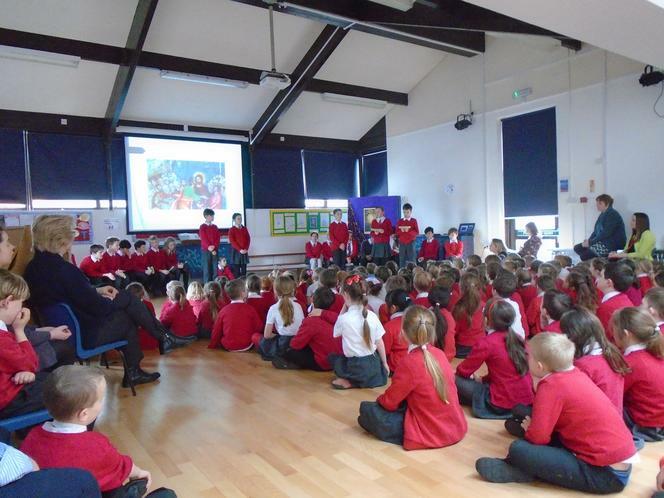 As part of our Holy Week in a Day activities the children found out about the work of CAFOD. 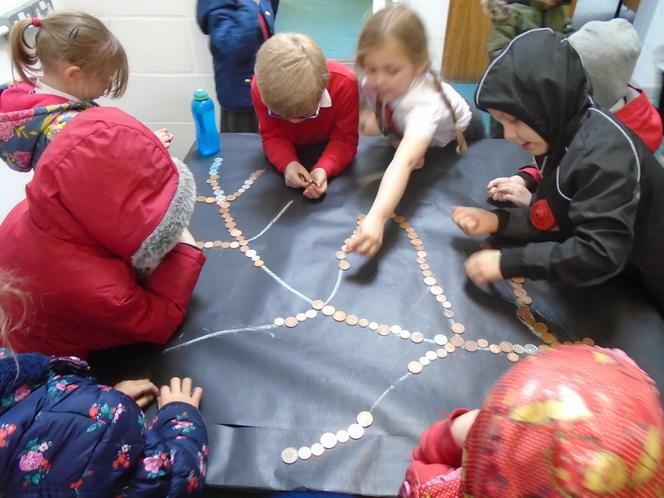 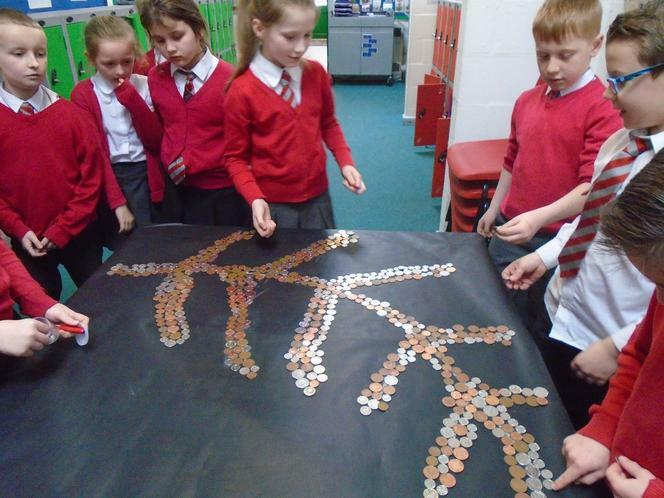 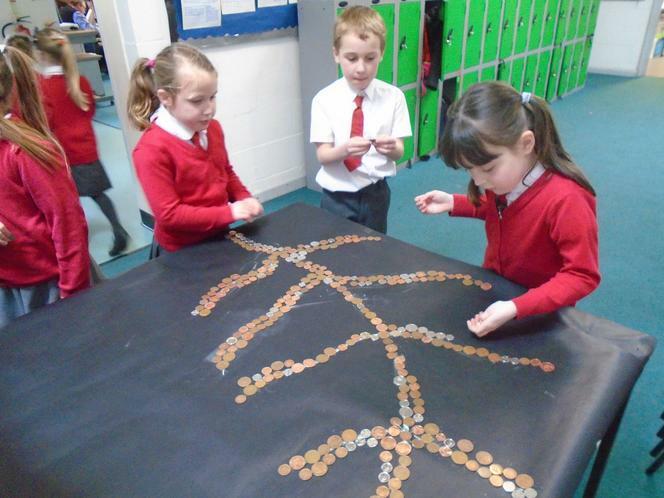 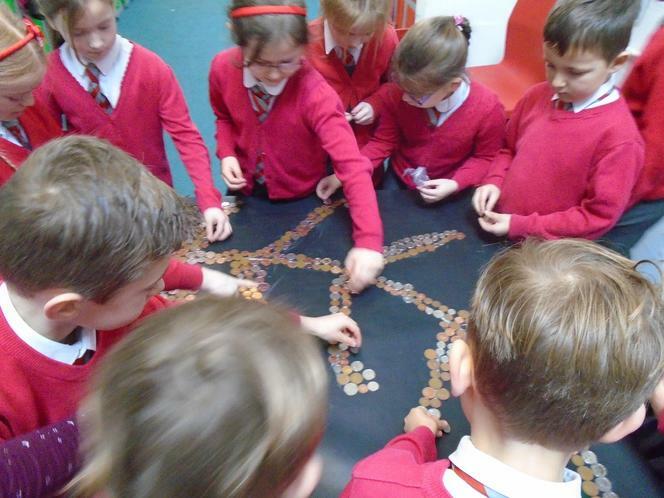 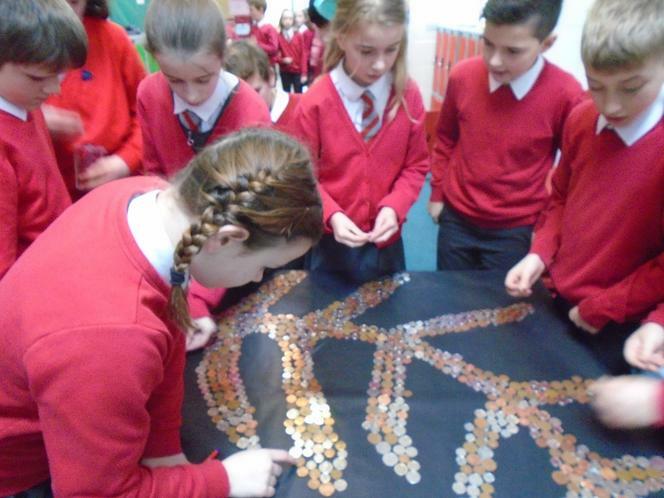 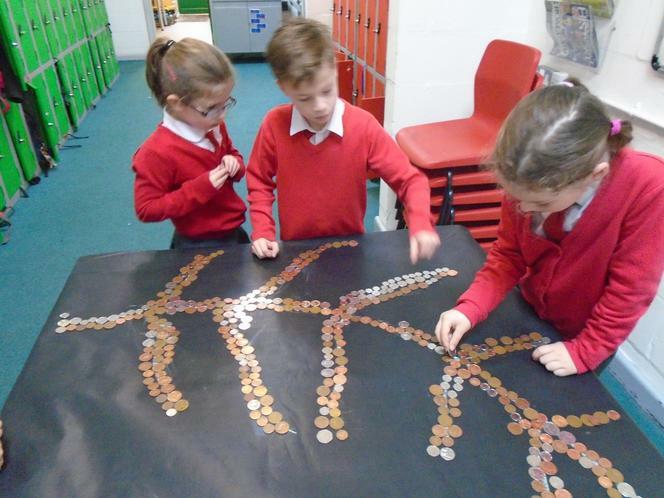 Each class added pennies to create a palm leaf, when complete, our leaf contained more than £80 worth of pennies. 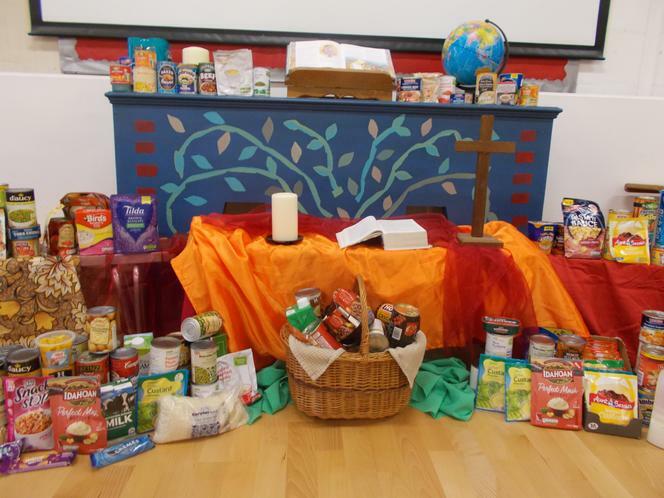 This will be added to the money from Year 6's frugal lunch and hot cross bun donations to be sent to CAFOD. 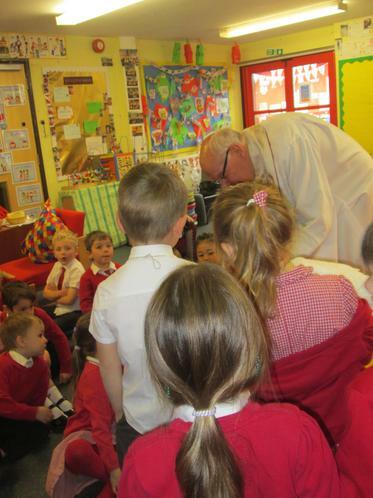 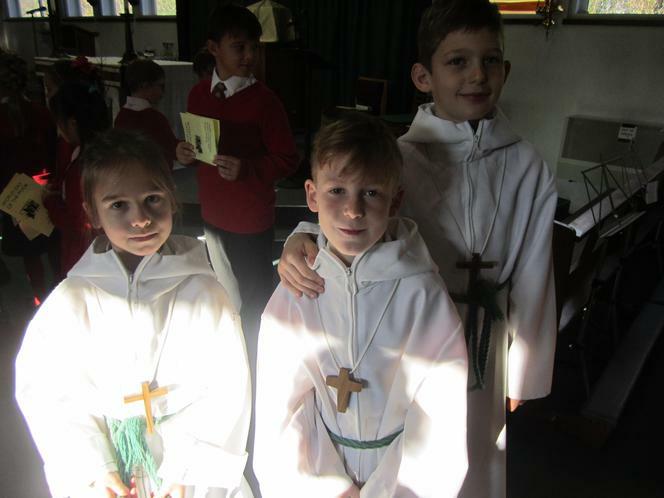 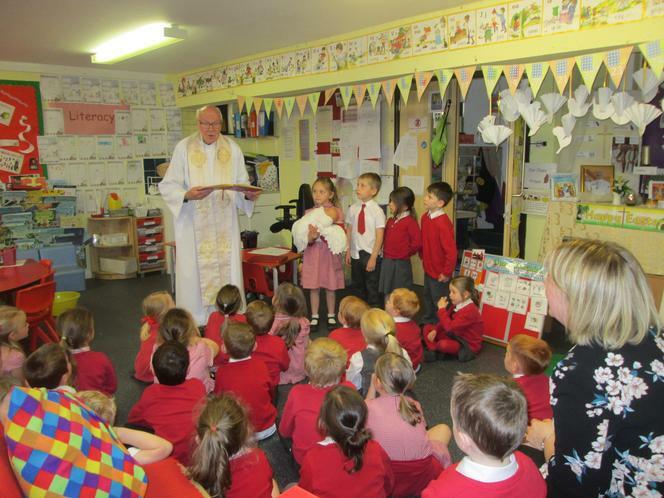 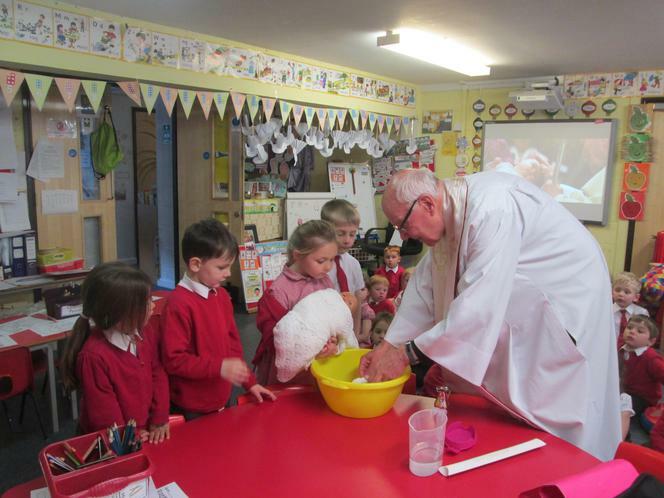 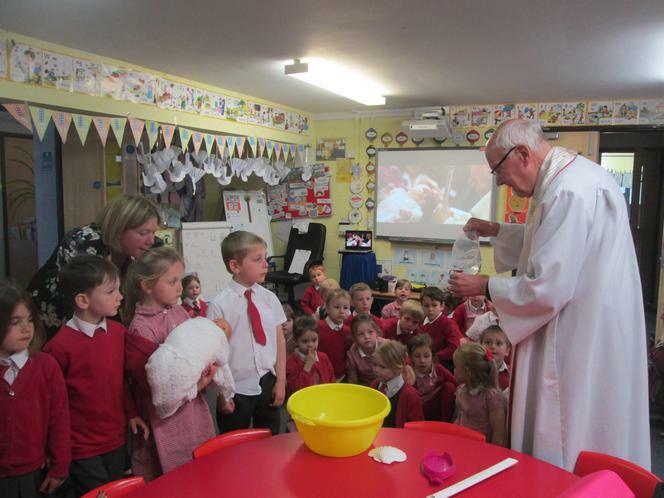 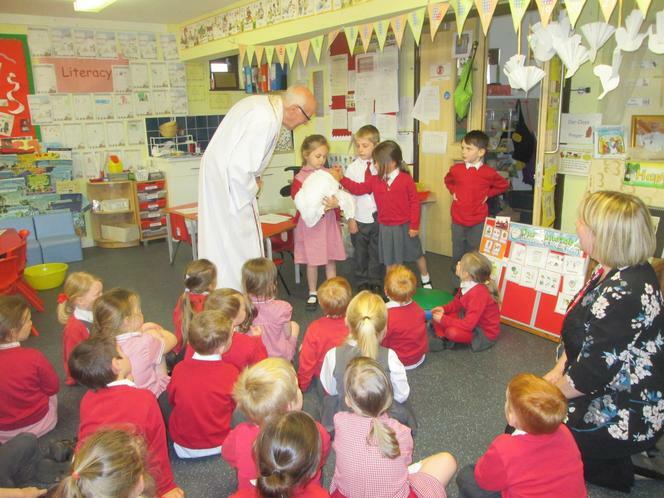 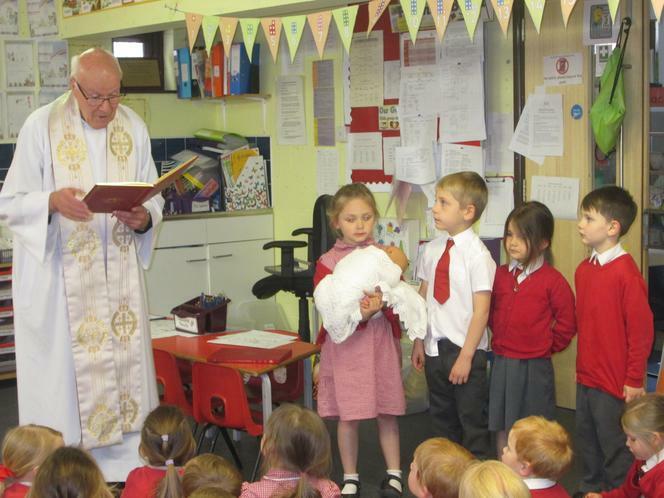 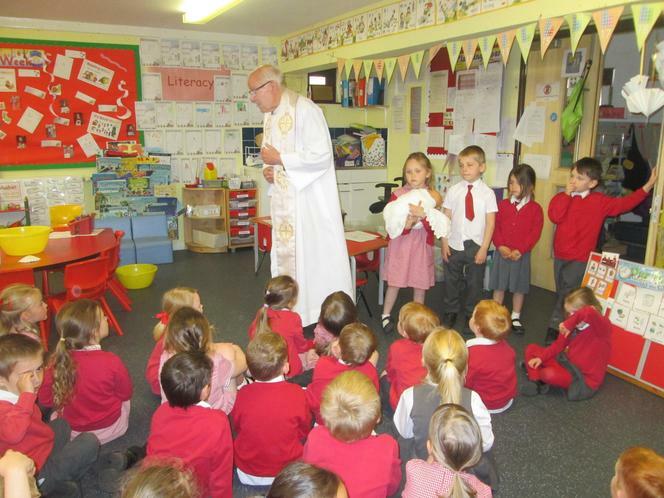 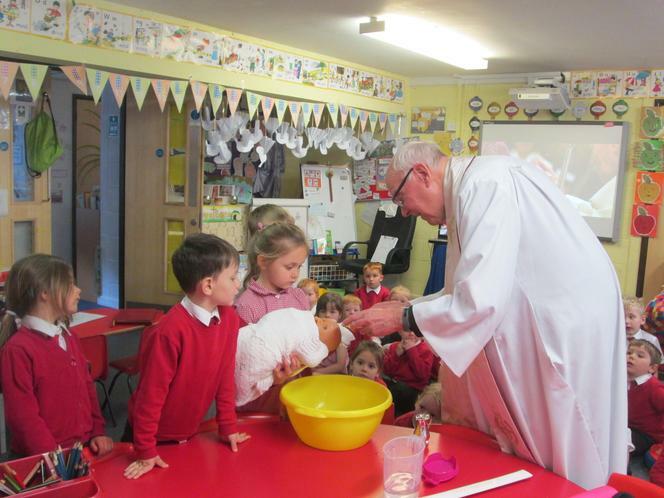 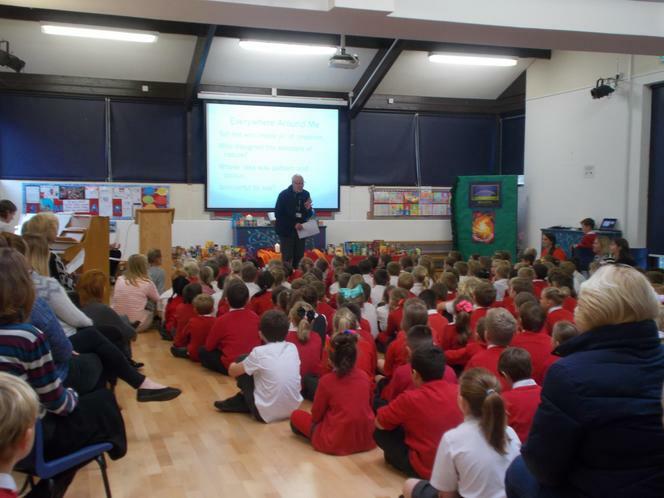 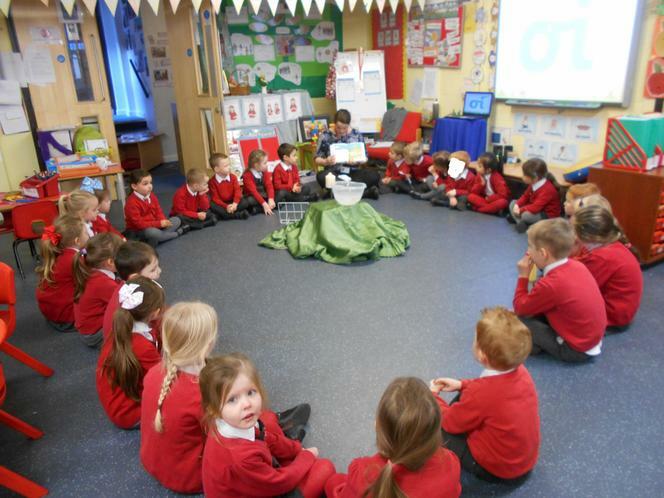 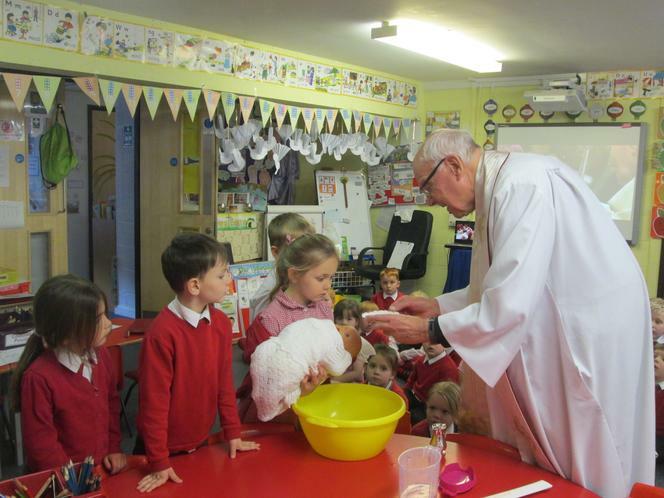 Father Paul visited Big Acorns to help them explore the sacrament of Baptism. 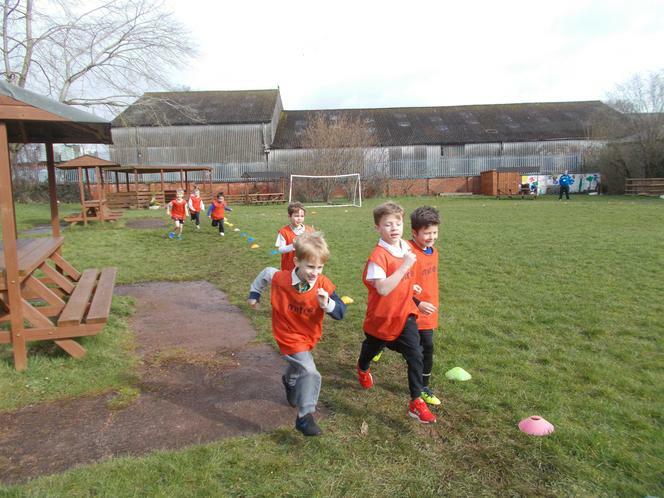 The children at St John's had a fantastic week of sporting activity to raise money for Sport Relief 2018. 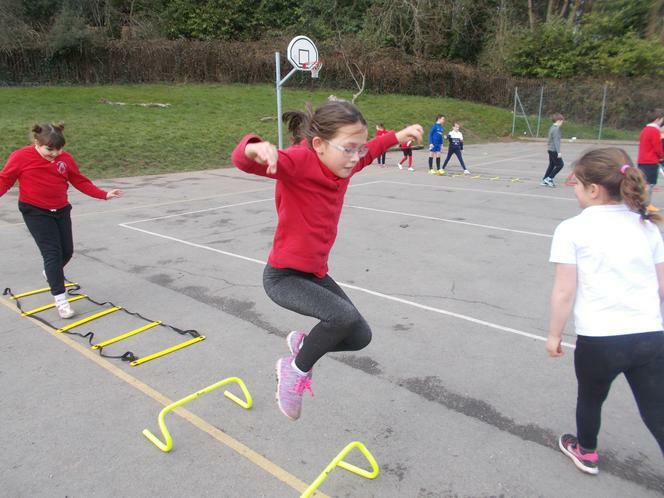 Throughout the week they had lots of fun participating in a skipathon, benchball tournament, dancing and a variety of lunchtime sports activities led by the Sports Crew. 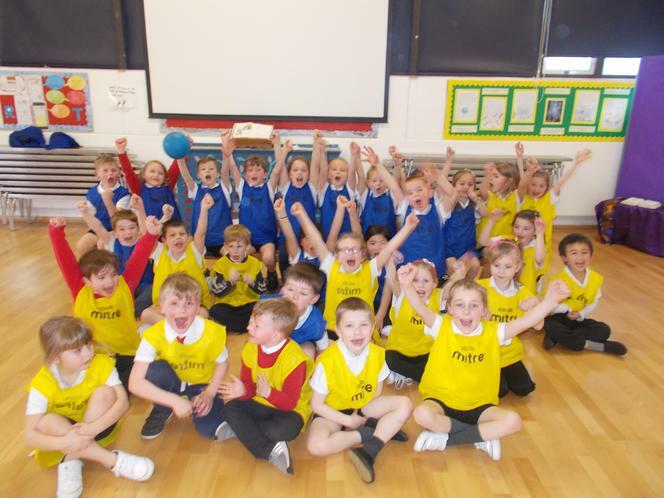 On Friday 23rd March staff and children came into school wearing sportswear or dressed as a sporting hero. 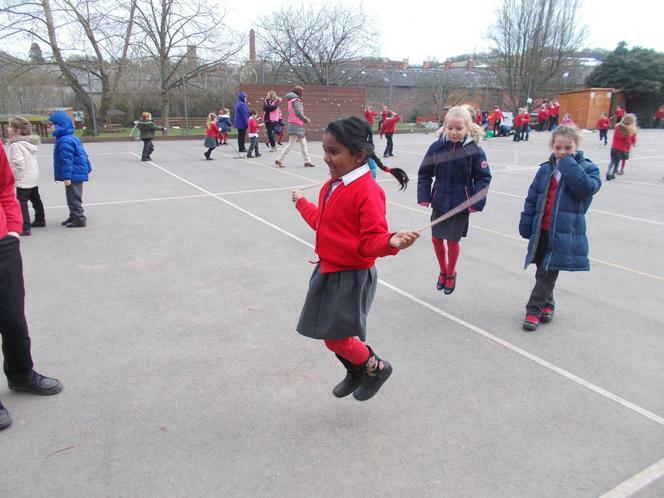 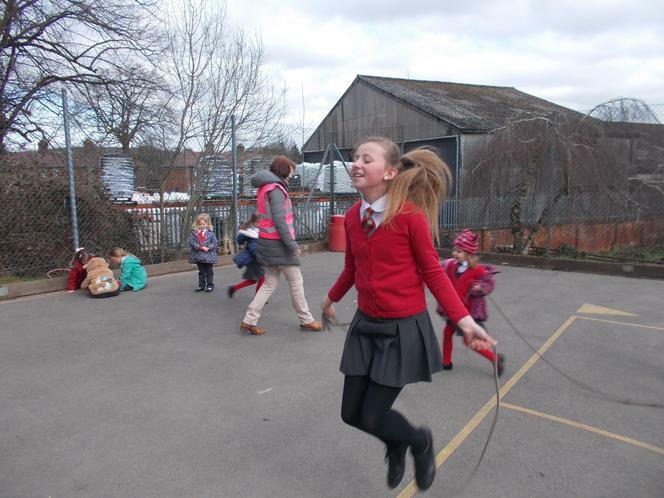 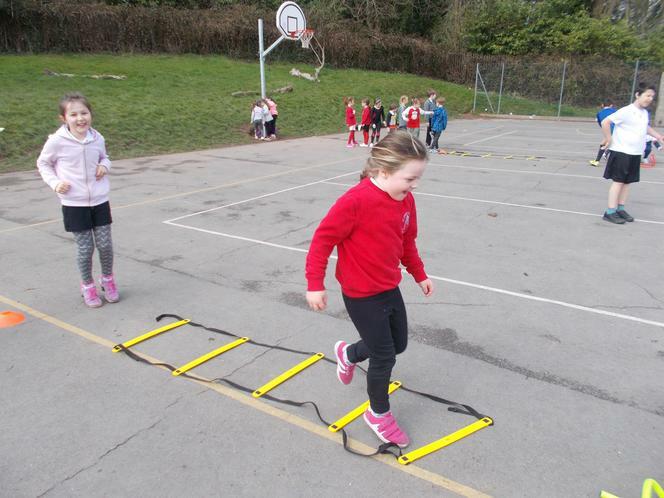 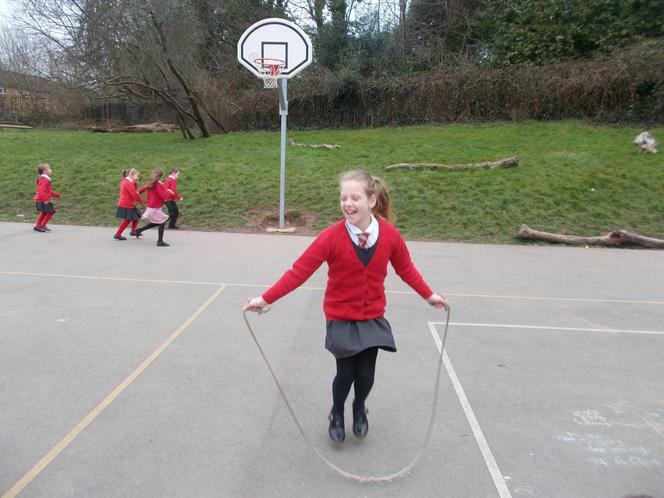 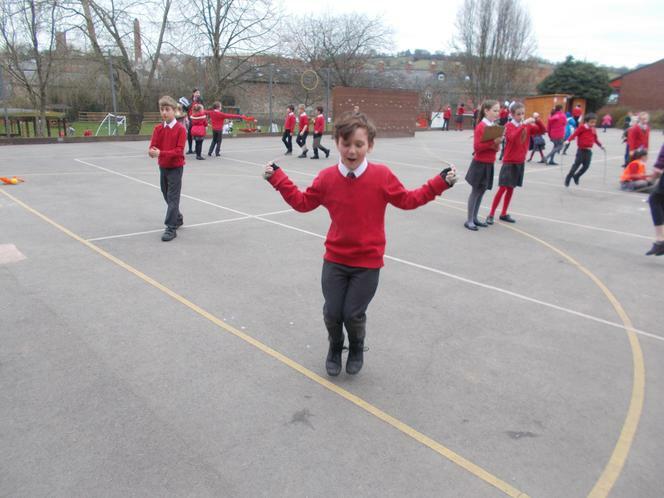 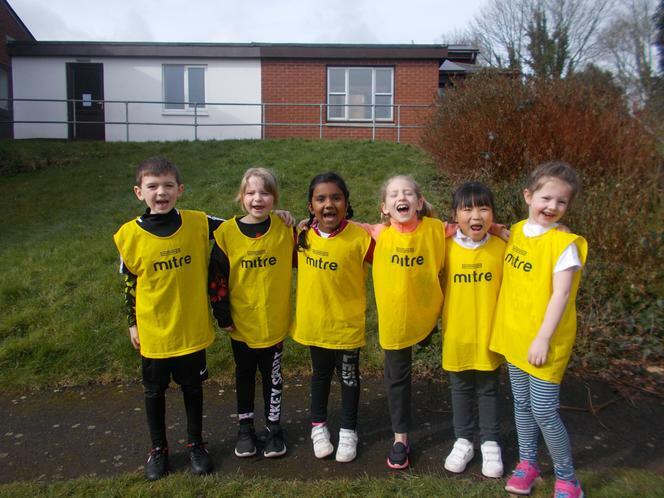 Big Acorns took part in an obstacle course and Key Stage 1 and Key Stage 2 completed the Sport Relief mile. 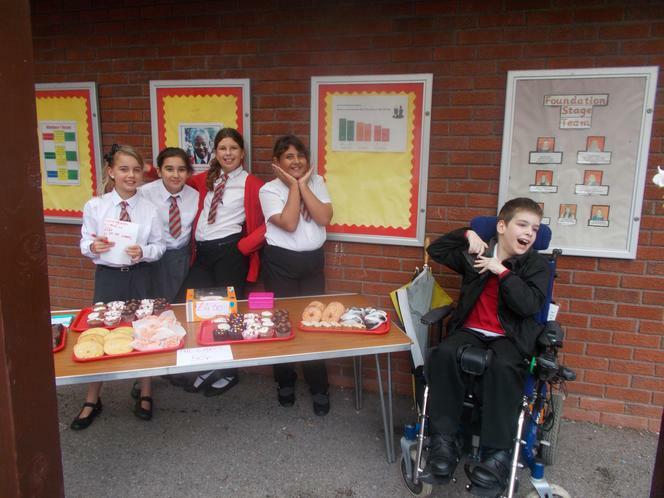 The Sports Crew also sold Sport Relief wristbands and held a cake sale. 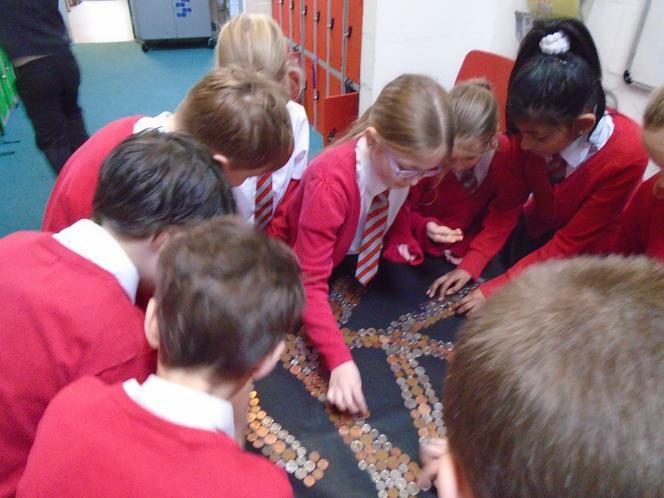 We are delighted to announce that, as a school, we raised an incredible £382 for Sport Relief 2018. 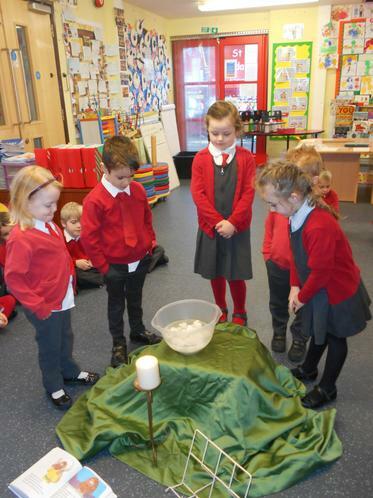 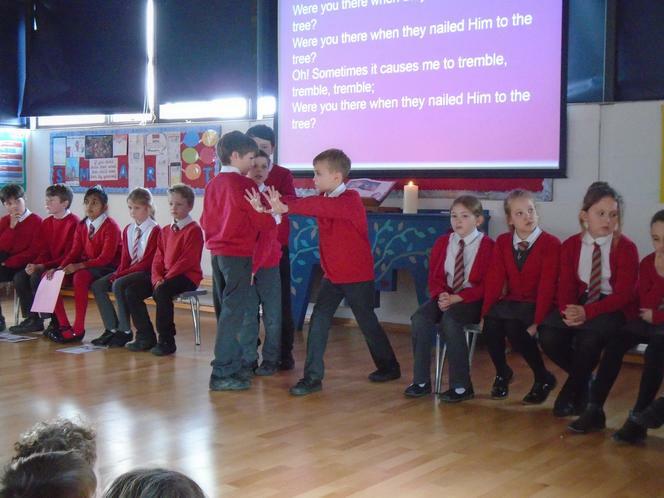 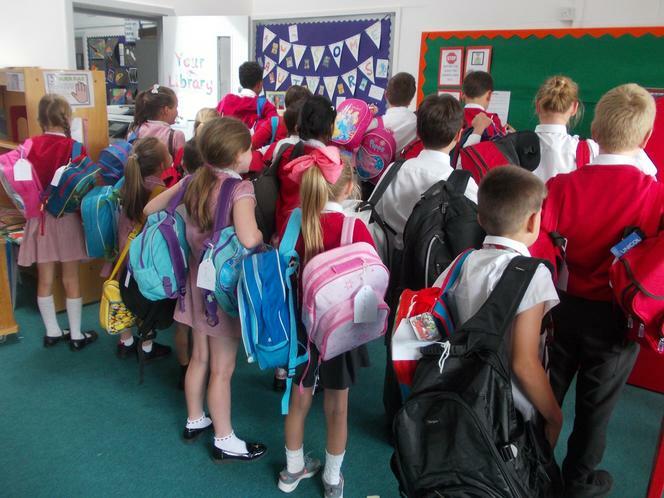 Big Acorns' class prayer this week was based on the parable of the Lost Sheep. 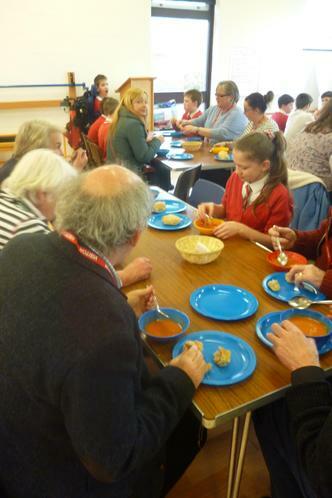 Year 6 welcomed parishioners, parents and governors to our frugal lunch. 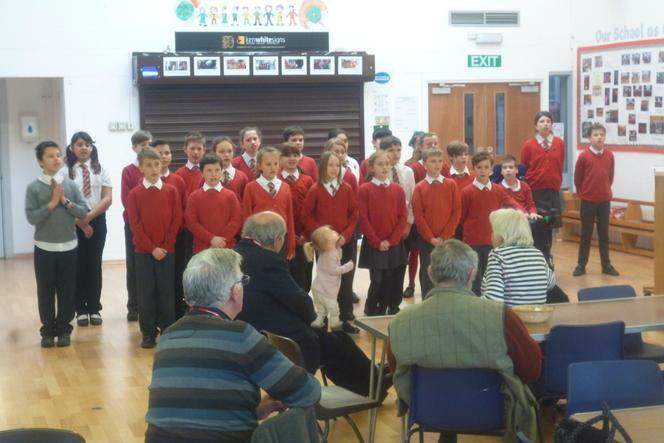 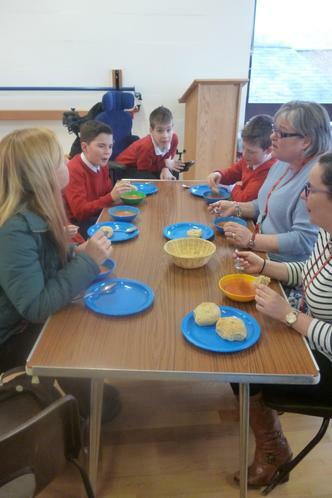 We shared soup and bread and Year 6 then entertained our visitors with songs. 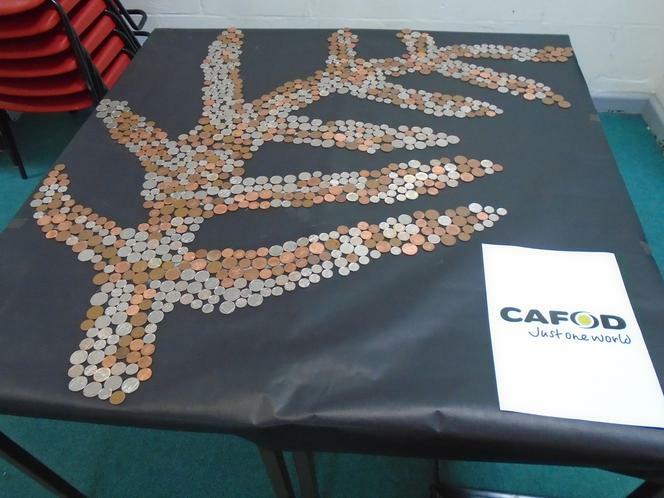 We were able to raise around £50 for CAFOD, a sum we hope to add to with more events before the end of term. 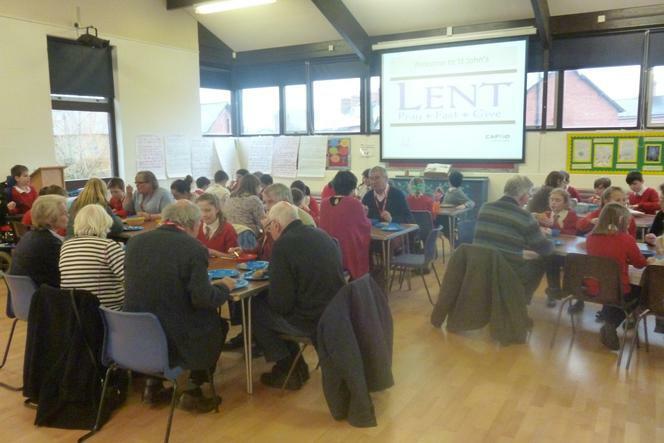 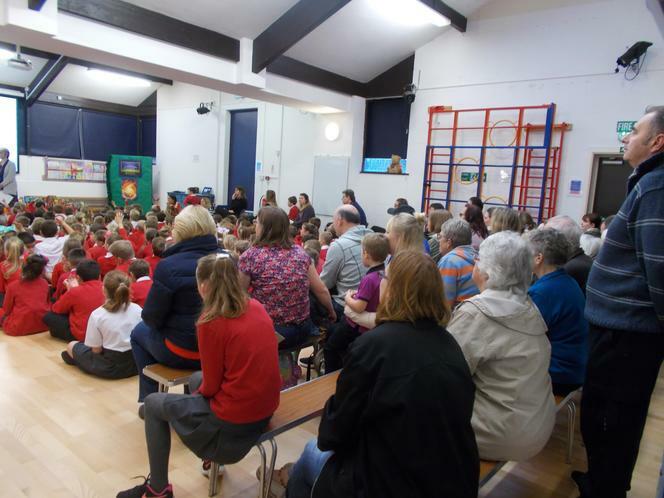 We were delighted to welcome visitors from many local churches to our liturgy for Christian Unity. 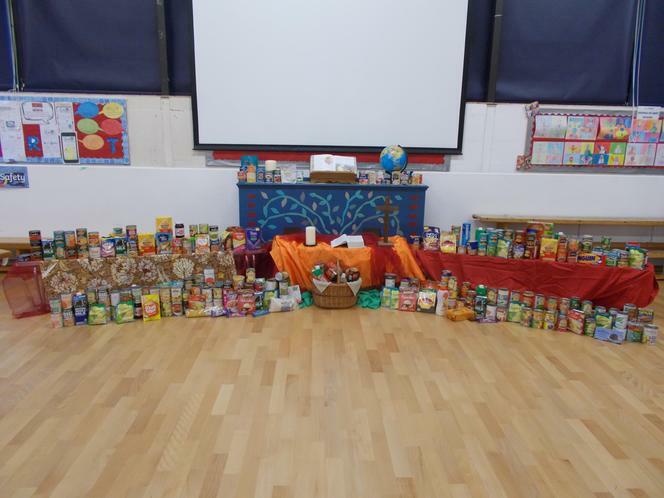 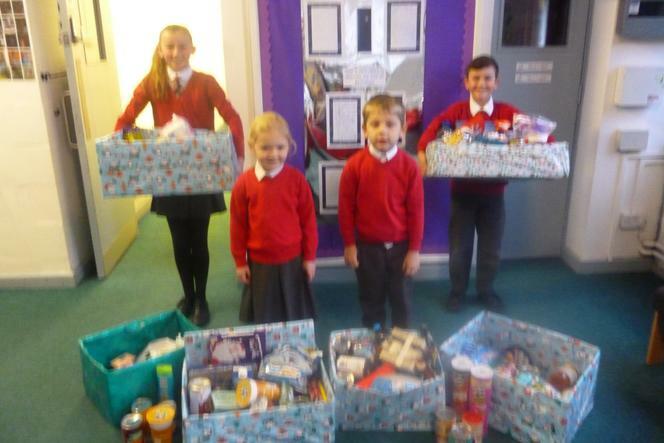 During Advent each class had been adding to their empty boxes, trying to put an item in each day during Advent. 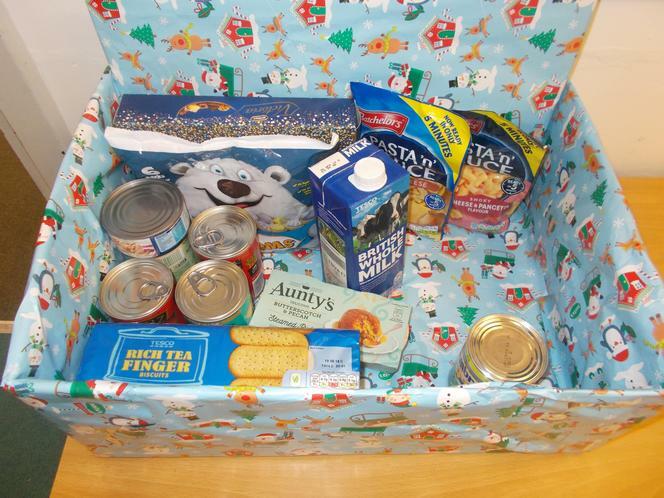 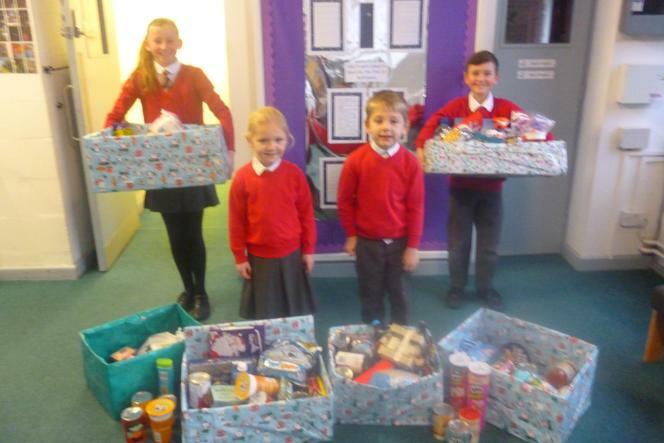 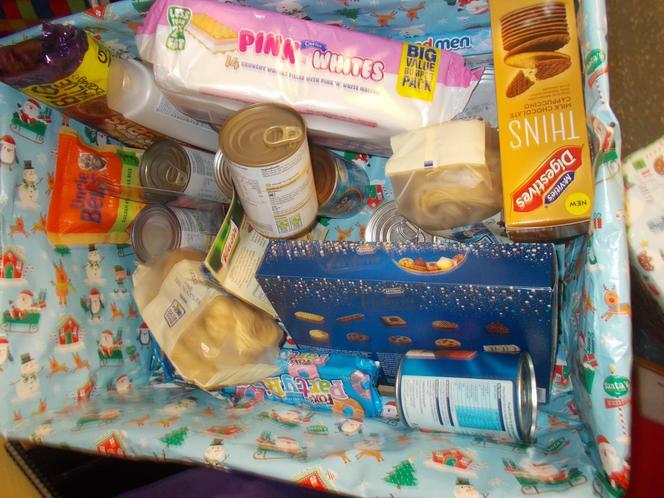 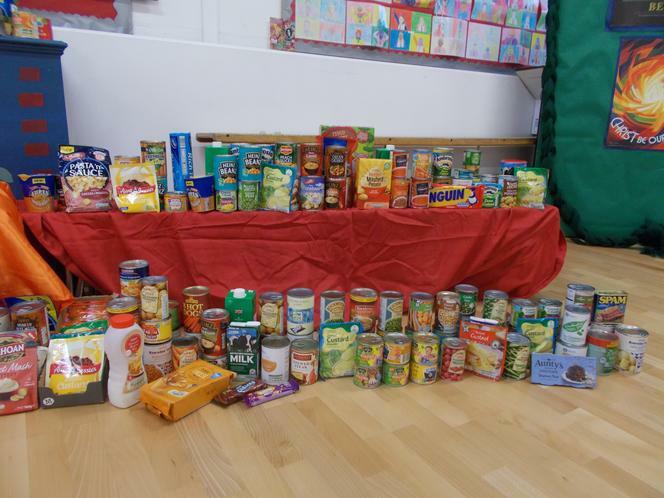 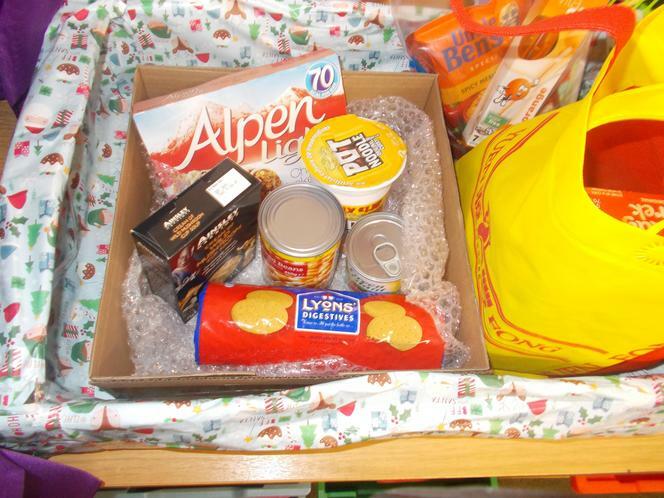 Our full boxes will be taken to CHAT to distribute to families in need over the Christmas season. 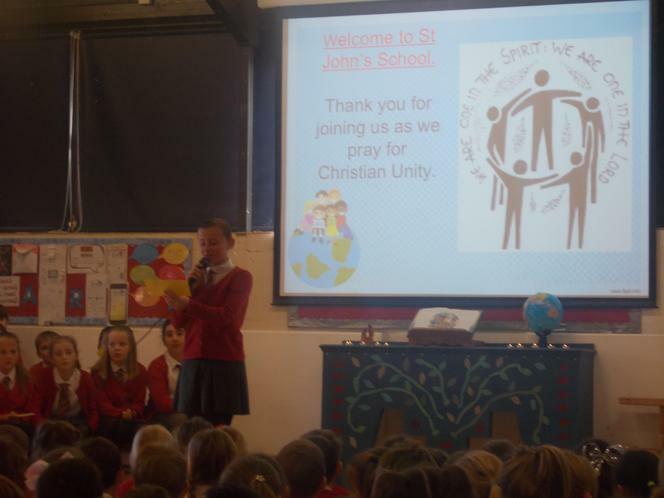 Earlier this year, talented KS2 artists designed and created a template for a sign to depict what life is like at St John's. 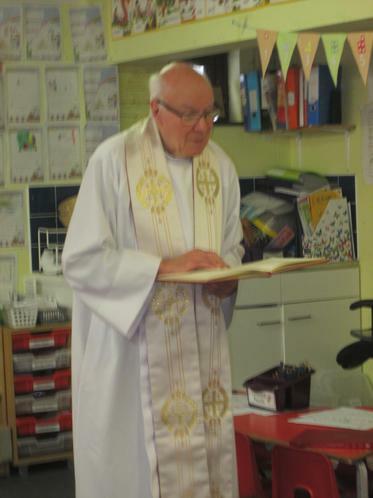 This was as part of Ken White's Golden Anniversary Year. 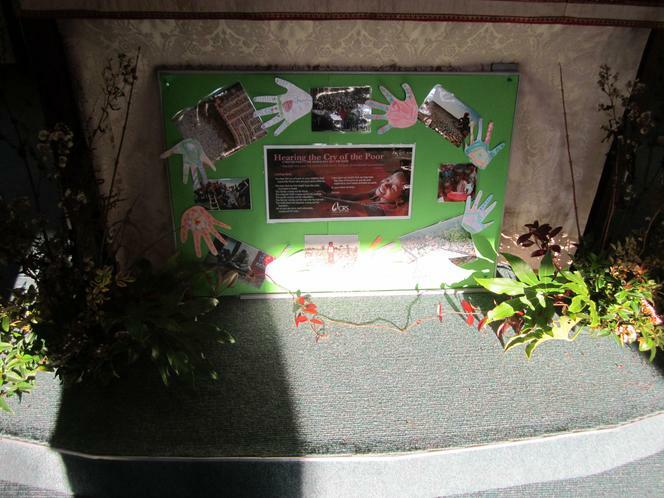 Ken White's printing company then made the banner and put up in the hall where it is seen by all. 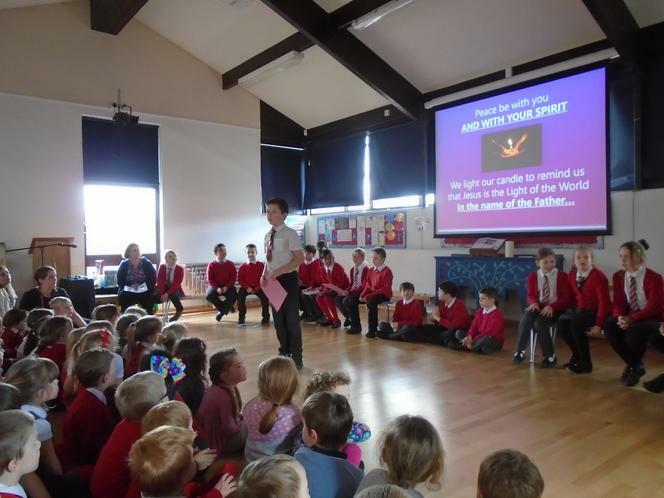 Parents and parishioners joined us to celebrate our Harvest Liturgy led by Year 6. 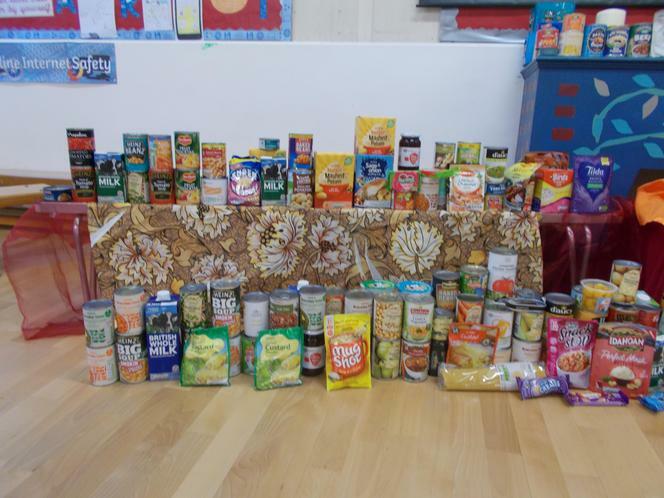 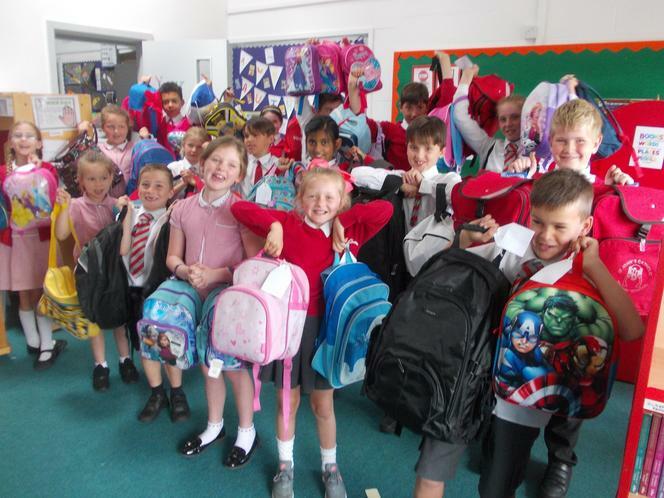 Thank you to everyone for your generous donations which were all donated to our local charity CHAT and will be given to people in need. 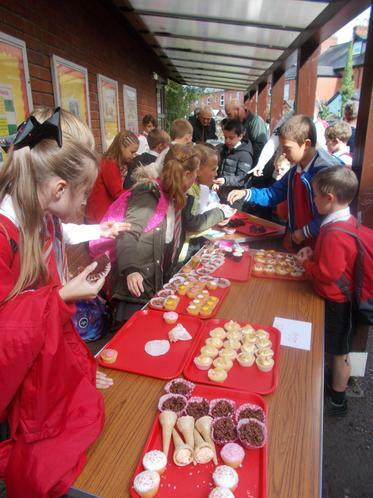 Year 6 organised a cake sale to raise money for Sundarban in Bangladesh. 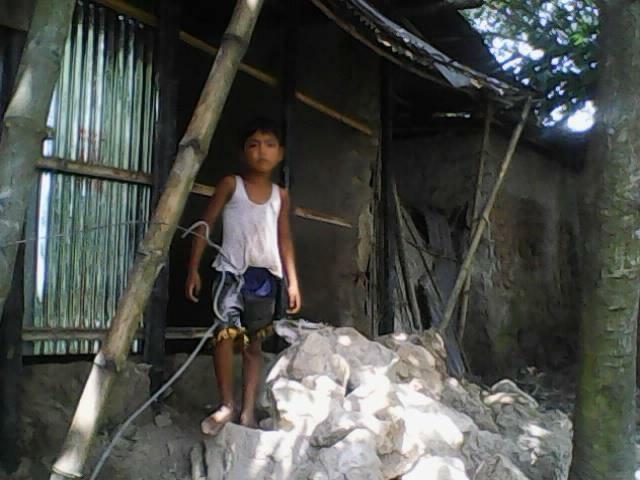 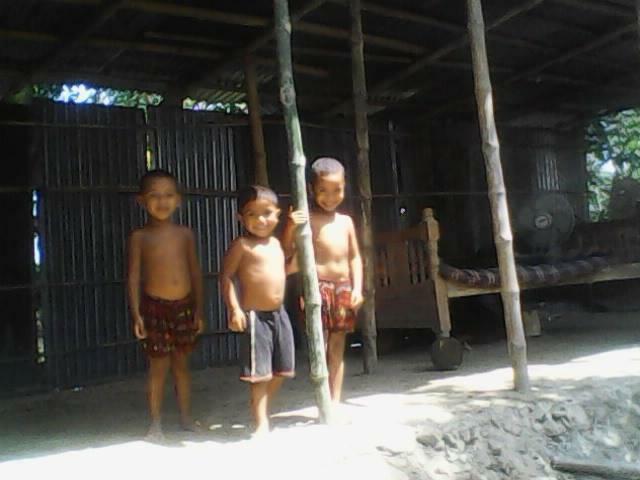 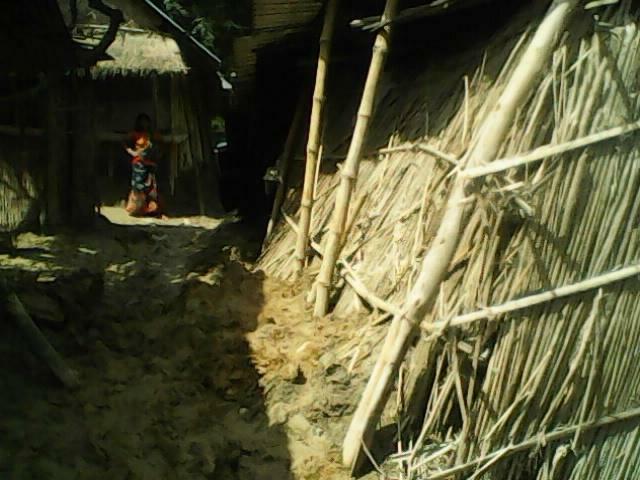 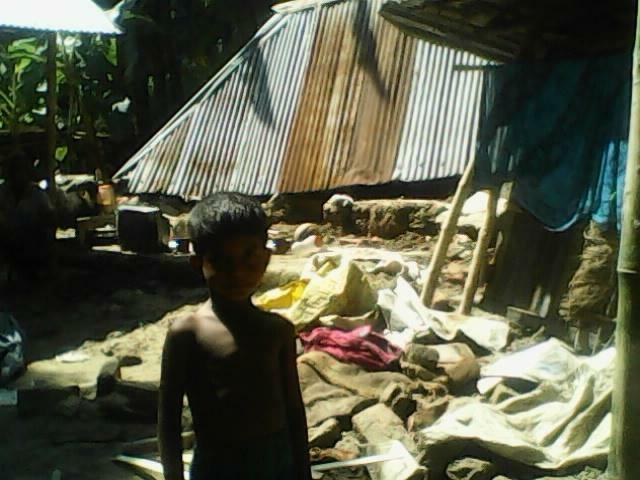 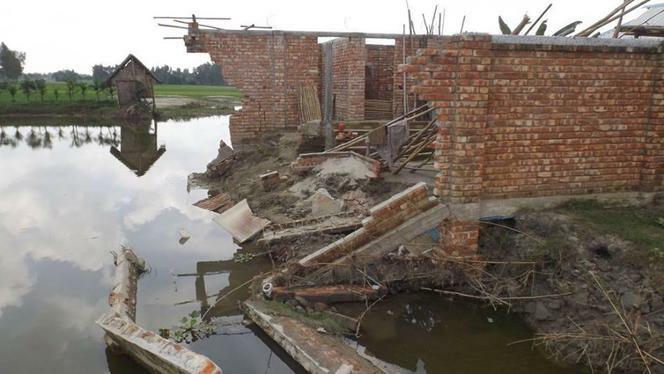 Sundarban has been devastated by recent floods and the money raised will be used to provide hygiene and cleaning products to families, as well as helping to rebuild damaged buildings. 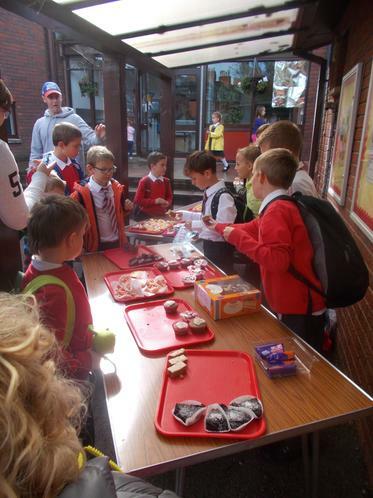 The total raised came to almost £100.